We had a good breakfast on the top of the hotel with a great view. It was a nice buffet but there were no eggs or bacon. They had to be a special order. We traveled about two and half hours before a break at an auto grill. Around noon we stopped at another one for lunch. 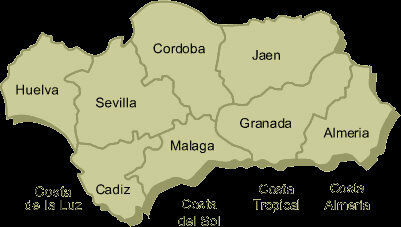 We are now in the southern region of Spain known as Andalusia. Andalucía is composed of eight provinces, stretching from the south-east to the south-west of the country, each one named for its capital city: Cadiz, Cordoba, Jaen, Huelva, Almeria, Malaga, Granada and Seville. Once Spain’s poorest region, Andalucía is now one of the most popular tourist destinatio ns in Europe thanks to its sandy beaches, beautiful countryside, spectacular mountain ranges, fabulous monuments and high-spirited people. 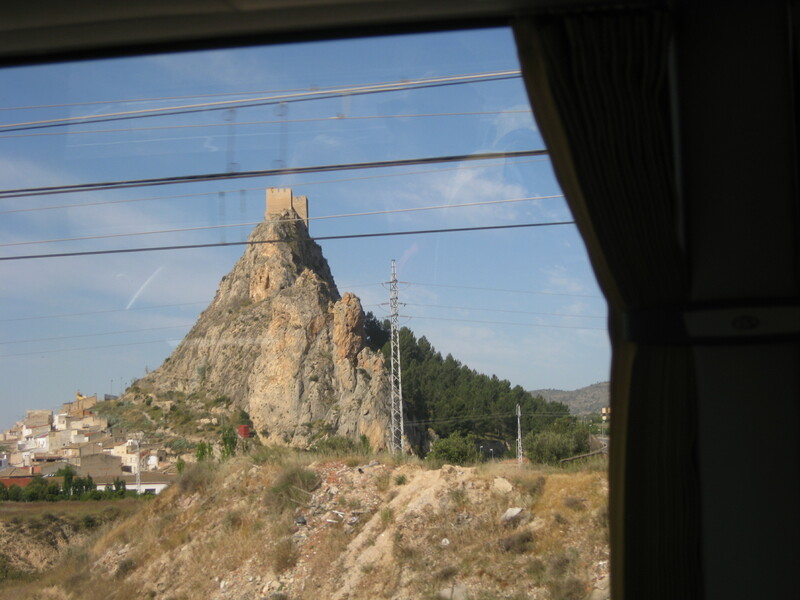 One of the most unique features of Andalucía are the remnants of its Moorish past. The Moors were a mixture of Berbers and Arabs who crossed into Spain from North Africa by the Straits of Gibraltar and occupied the peninsula – which they called al Andalus for more than seven centuries dating from 710. Within four years they had virtually conquered the entire country. 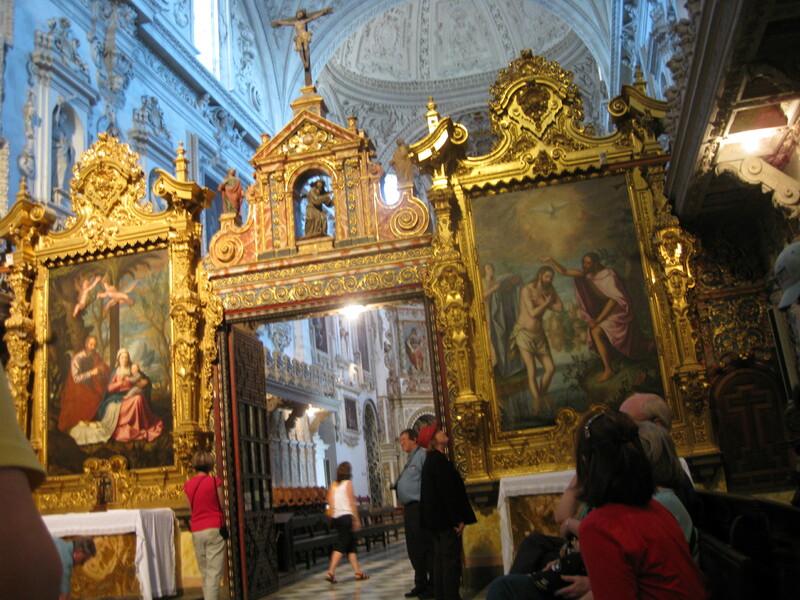 Córdoba becomes the center and melting pot of different cultures and religions. Trade, science, handicraft and arts grew and expanded. After the fall of Córdoba (1236) and Seville (1248) the Nasrid Kings maintain their kingdom in Granada for two and a half centuries more. 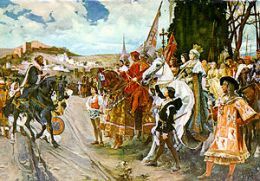 The last Moor king, Boabdil, surrenders the city of Granada to the Catholic Monarchs Isabel and Ferdinand in January 1492. 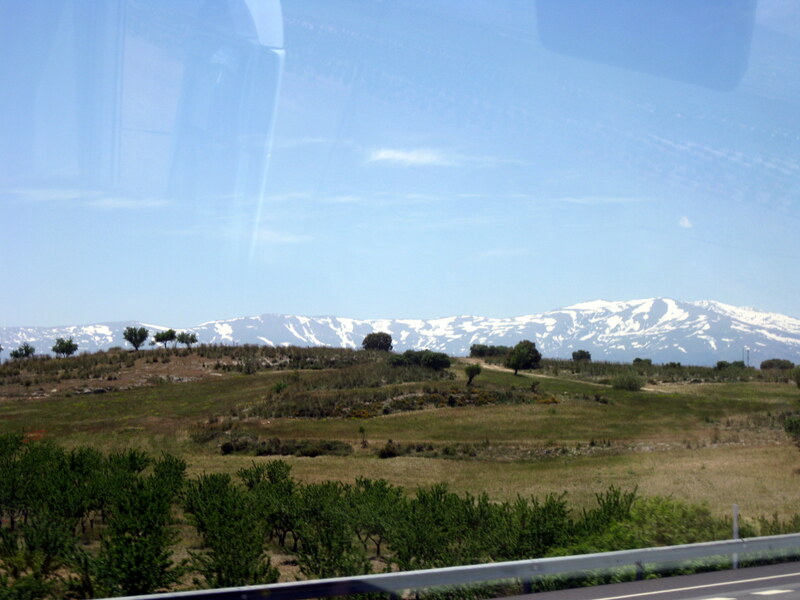 As we neared Granada, we could see the snow on the Sierra Nevada mountain range, until then the scenery had been rather monotonous. 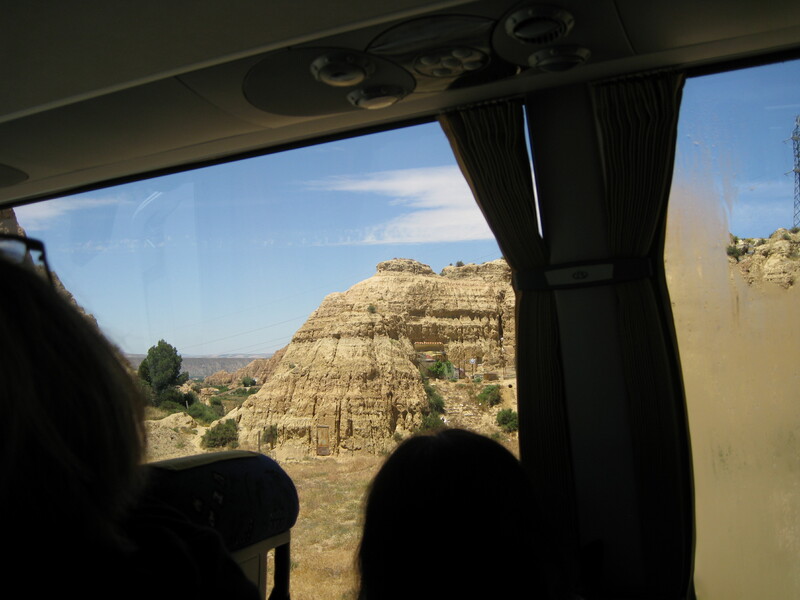 Outside of Granada we saw the cave dwellers on the hillsides. People still live in these caves. As we drove into the city limits of Granada traffic came to a standstill in all directions. Our bus driver knew a lot of back streets through town and got us through. We found out later that there had been a motorcycle accident. A board had come off of a truck and struck the motorcycle driver and killed him. They said traffic was tired up for hours. 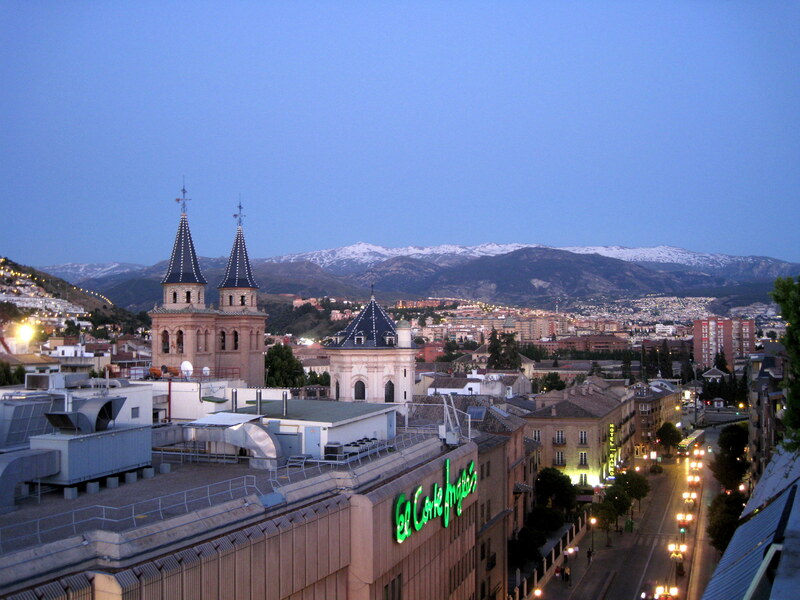 Granada is about 2,200 ft. above sea level in the foothills of the Sierra Nevada. The town sprawls over two main hills, the Alhambra and the Albaicín, and is crossed by two rivers, the Genil and the Darro. This former stronghold of Moorish Spain is full of romance and folklore. We arrived at our hotel, Carmen, and checked in. An optional tour was started immediately. My wife choose not to go on it. First it was a walking tour through an old part of town to the Royal Chapel which is attached to the Cathedral. 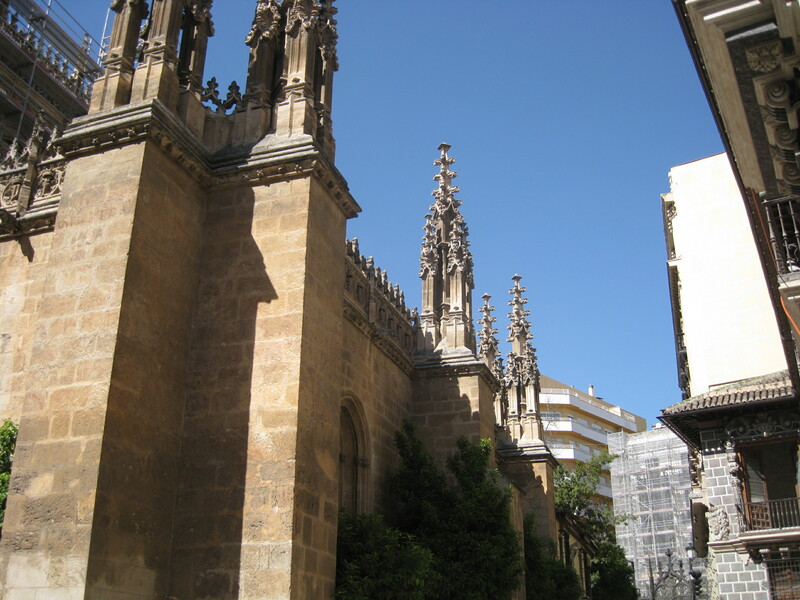 The Royal Chapel has the tombs of Ferdinand and Isabella. It was their wish to be buried in recaptured Granada. Occupying much larger tombs are the remains of their daughter, Joanna the Mad, and her husband, Philip the Handsome. The architecture is flamboyant Gothic and Plateresque, which is a richly decorative style of Spanish architecture of the 16th century; said to resemble the intricate work of Spanish silversmiths in delicacy, hence its name (plata is the Spanish word for silver). Work was begun by Enrique Egas in 1506 but not completed until 1521 under the Emperor, Charles V.
After leaving the chapel we entered the sacristy where we viewed Isabella's personal art collection, including many works by Flemish masters and various Spanish and Italian artists, including Rogier Van der Weyden and Botticelli. A glass case contains Ferdinand of Aragón's sword, Isabella's scepter and crown. 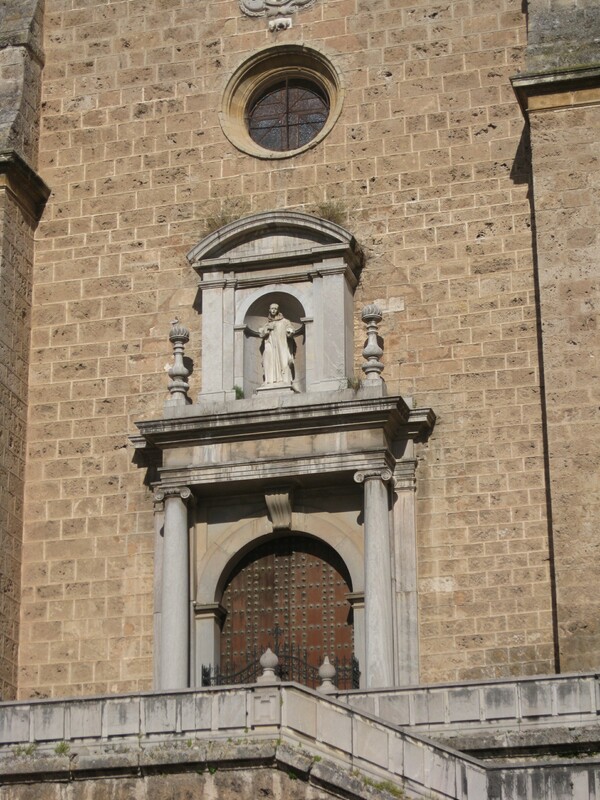 Above the chapel's entrance doorway is a copy of the famous painting of Boabdil's (the last Moorish King) surrender to Isabella. She is depicted wearing her filigree crown. I was very disappointed that this tour did not take us into the cathedral itself. We walked back to the hotel and got on the bus which took us up a high hill with a great view of Granada and the Sierra Nevada range. Our next stop was the Carthusian Monastery. The bus dropped us off in a small drive way. We had to climb a number of steps to the main door. The building appears small and the façade was rather plain. There is a statue of St. Bruno, the founder of the Carthusian Order in 1027. This monastery was built on the grounds of an Arab recreational estate, called Aynadamar or Source of Tears. In the early 1500’s the Community of the Carthusian Order of El Paular made a decision to build a new monastery but they did not find a specific site and so they put it aside for a few years. Later, Fr. Juan Padilla, prior of the monastery Cartuja de las Cuevas in Seville turned to Don Gonzalo Fernandez de Cordoba (known as the Great Captain) and his wife for help. He proposed building the monastery on the grounds of the Aynadamar Estate. He even offered to take charge of the project with the initial idea of being buried in this new monastery. The donation of this land was in 1513. Several difficulties interrupted the work, among them the Great Captain’s death in 1515. Before he died, he had some disagreements with the monks which made him change his mind about being buried there. 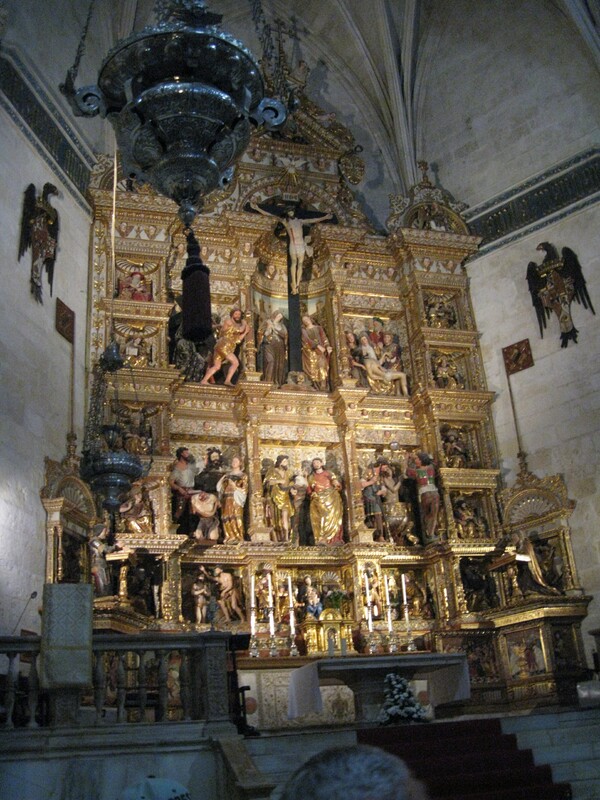 Work was resumed again in 1519 and in 1545 the Carthusian Monastery of Granada was incorporated into the Order. All that is left of the entire monastery today are the Small Cloister, the Church, the Tabernacle and the Sacristy. The rest disappeared in 1842 with invasion of French troop and the Disentailment (the expropriation of the property of religious orders by the state in 1837). Presently the monastery does not belong to the Carthusian Order, but depends directly on the Archbishopric and the Diocese of Granada. The inside the monastery is very different in its appearance from the outside. We entered through a small cloister which contained orange trees, rose bushes and aromatic plants with a fountain in the center. It looked more like a Moorish courtyard than a typical monastery or cathedral cloister. The first room that we entered was the refectory or dining hall. Over the door was a painting of John the Baptist after his beheading with his head on a platter. At the end was a large painting of the Last Supper. It was noted that there was a fish on Jesus’ plate instead of lamb as the Carthusians didn’t eat meat. There were a number of paintings around the room representing the persecutions and executions of the monks in England by Henry VIII and the Huguenots in France. These paintings are rather graphic. The Baroque church dating from 1662 was very impressive. There were three distinct sections. The first, from the entrance to a gate, was for the faithful. The second, from the gate to beautiful Marquetry door (1750), was for the lay brothers. The third section is for the monks. This section is totally cut off from the church. The seats are so high that the monks couldn’t see each other. There is no choir or orga n as the Order forbid them. 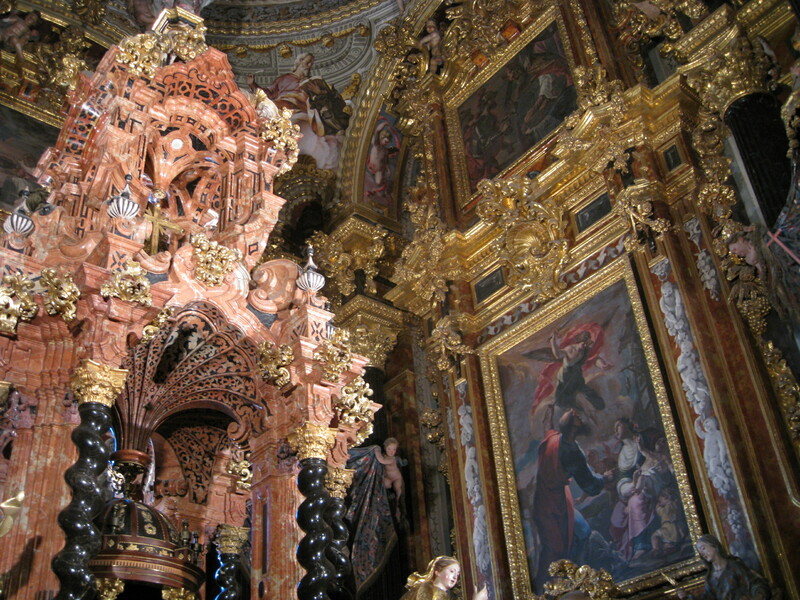 There is also a b eautiful Sancta Sanctorium with a huge carved baldachin. 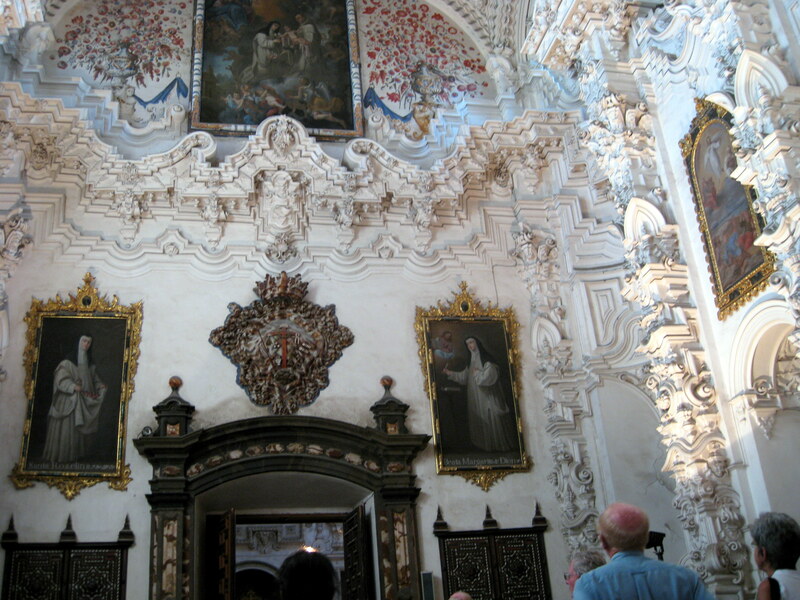 Also impressive was the Sacristy which was brilliant white marble in a very baroque style. The entire visit was very impressive. I am glad that I went and sorry that my wife missed it. My wife took a half hour nap and then went off to the Royal Chapel and the Cathedral on her own. She said that she was satisfied to be “in the presence of Isabella, Ferdinand, Juana the Mad and Philip the handsome. What amazing four people.” She was accosted often by gypsies at the chapel and cathedral. She found the cathedral was huge with wide aisles and huge pillars. She also did some shopping on her venture. She was concerned about finding her way back home. She got back just a little after I did. We went to the bar for drinks. We had some “crisps” (potato chips ). Several of our group joined us. The buffet dinner was in the hotel. There was a good selection of food, all very tasty. We were told that we could go up on the roof to see the view. We could see the Sierra Nevada with its snow. No matter how spectacular the man-made buildings, the God-made snow made it all fantastic.